Don't toss out those citrus peels--turn them into candy instead! Orange, lemon, or grapefruit peel all be used to make these deliciously sweet-tart Candied Citrus Peel strips. Chop them up and use them in other baking and candy recipes, roll them in sugar to give them a crunchy shell, or dip them in chocolate for the ultimate treat! Since you'll be eating the peel in this recipe, I recommend using organic produce if possible. 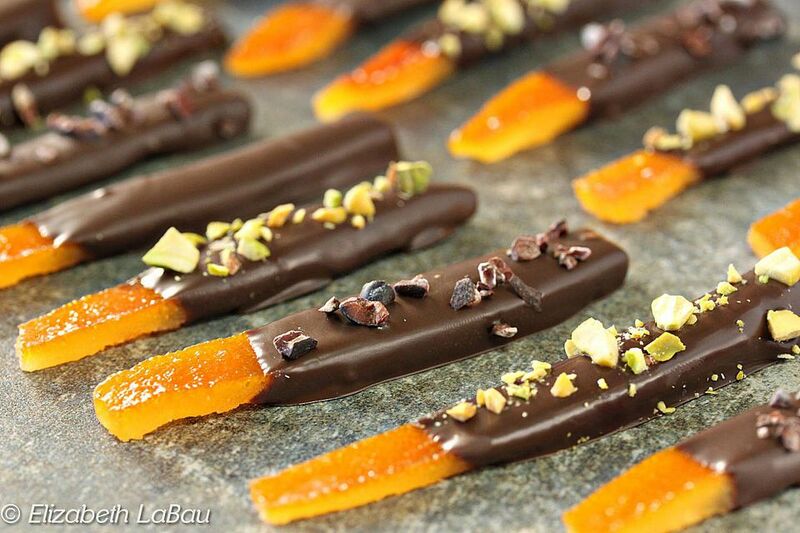 Don't miss the photo guide with step-by-step instructions for how to make candied citrus peel! Use a knife or a citrus peeler to score the peels of four oranges (or whatever citrus fruit you're using) into quarters. Peel the oranges carefully, trying to keep the peels intact as much as possible. Set the peeled oranges aside and reserve for another use. Slice the peels into long, thin strips approximately ½” thick. Using a sharp knife, cut away the bitter white pith from the underside of the peels. Don't worry if small amounts of white pith remain. Place the peels in a medium saucepan and cover them with cold water. Place the pan over high heat and bring the pot to a boil. Once boiling, remove the pan from the heat and drain the peels out. Repeat the process of boiling the peels twice more--this step removes much of the bitterness from the peels and gives you a sweeter end product. Combine the water, sugar, and corn syrup in a medium saucepan over medium heat. Stir occasionally while the sugar dissolves, and bring the sugar syrup to a simmer. Add the strips of peel and turn the heat down to low, until the mixture is just at a simmer. Press a circle of parchment on top of the peels to prevent the top peels from getting leathery. Simmer the peels at a low heat for about an hour, until the peels are translucent. Remove the saucepan from the heat and allow it to cool to lukewarm. Once cool, fish out the peels and set them on a wire rack over a baking sheet to dry out. You can let them dry out naturally, for about 24 hours, or you can speed up the process by using the oven. To use the oven, turn it to the lowest heat setting (just barely warm) and place the tray of peels in the oven. Check them after 20 minutes, and continue to warm them, checking frequently, until they're no longer wet and sticky, but still have some softness to them--don't let them get hard or leathery! The peels can be chopped at this point to use in baked goods or other candy recipes. If you want sugar-coated peels, roll them in granulated sugar. You can also dip your peels in melted chocolate. Make sure that they're not too wet (excess moisture will make the chocolate clump up) and dip them in melted chocolate candy coating or tempered chocolate. Set the dipped peels on a baking sheet, and if desired, sprinkle the tops with crushed nuts, cacao nibs, sea salt, or anything else you can dream up! In a dry environment, candied peels can keep for several weeks in an airtight container.